I run across some of the most interesting items of heraldry sometimes. 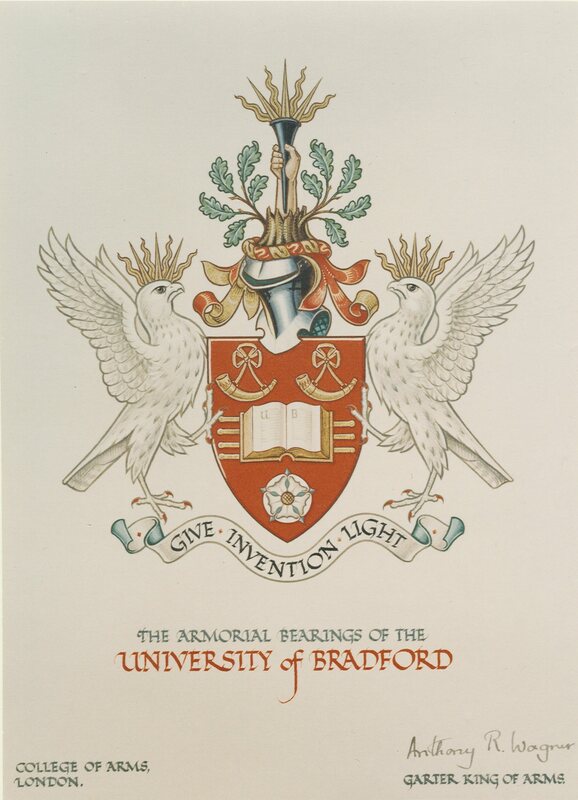 Most recently, it was a coat of arms in a series entitled “100 Objects from Special Collections at the University of Bradford,” specifically number 23: “Give Invention Light: the University of Bradford Coat of Arms” which was posted on July 27, 2011. The University of Bradford is a university in Bradford (I know! Who'd have thought it? ), West Yorkshire, England. Formed from a technical college in 1966, the University received its grant of arms at that time. As is often the case in heraldry, the University’s coat of arms is just teeming with meaning. Fortunately, here we can find out what each element means. (This is not often the case. And those books and websites which purport to tell you the “meanings” of the colors and lines of division and charges on coats of arms are basically making it all up. I’m sorry to burst your bubble, but it’s true.) Every feature of the University’s heraldry makes a point about its Yorkshire location or its technological emphasis at the time the design was created. The University’s continued emphasis on the practical application of knowledge makes the original meanings appropriate today. There’s even a short video on that page that goes through the various elements and their meanings to the University, as well as a link to a Word document that describes not only the meanings of the elements in the University’s arms, but also a bit of background about the Bradford city coat of arms, as well. Elements from the University’s coat of arms (the book and the hunting horns) have also been incorporated into the University’s more recent non-heraldic logo.